G2 Crowd, the world’s leading business software review platform, yesterday released the Winter 2018 Content Marketing Grid® report to help businesses make the best Content Marketing technology buying decision. 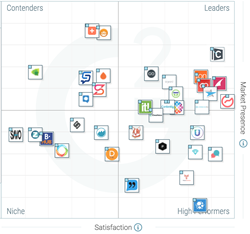 ClearSlide, Uberflip, Outgrow, ion interactive, Joomag, Curata, LookBookHQ, Skyword, Ceros, TechValidate, Contently, Showpad, Scoop.it, and ClearVoice were named Leaders in the report, receiving a strong customer satisfaction score with a large market presence. UpContent, Opinion Stage, Sparkle, Pressly, TrackMaven, TrenDemon, Flockrush, and Sorc'd were named High Performers in the report, earning strong customer satisfaction marks with smaller market presence scores. Outgrow received the highest overall satisfaction score and AddThis earned the highest overall market presence score.